Sorry to bring you guys with big iron down to this level, but my wife and I are considering buying a hobby farm for keeping/boarding horses. Living now in a condo, this will be a big step, especially in equipment. One property we're considering is 10 acres with three pastures and a decent stone dust outdoor riding ring. No hay fields. 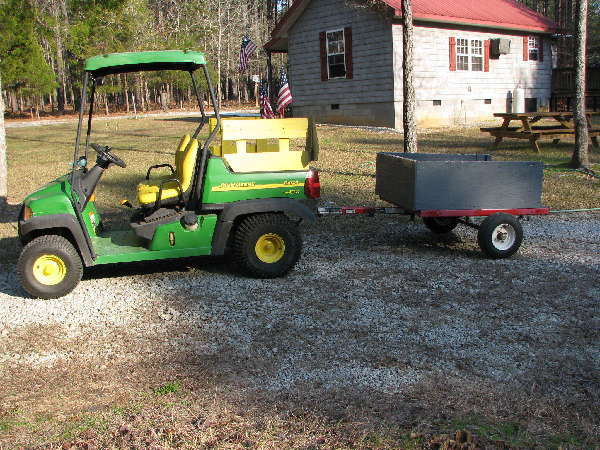 - maybe pull a small trailer to move around stall muck? The pastures have only been mowed along the fenceline all year so the grass is a few feet high. It seems to me that anything I buy won't do that job, so I think we'll need to hire/borrow gear to brush hog them. Value is a big issue for us, and I expect to maintain/repair the equipment myself as much as possible. I'd appreciate your inputs - I know somewhere between a tiny bit and squat about tractors right about now. Your brand choices are very broad and as varied. IMHO it all depends on your budget, so work backward from there. If money is an issue, the last thing you wanna hear is what you really should get---and know it's out there---but is out of reach. If that's the case, you'll be kicking yourself when the neighbor drives by and you think, "I wish I had that." I like to tell myself that I don't miss what I don't have (knowledge) about. And for example by that I mean if you can only affrod a gear transmission, but you test-drove a hydrostatic trans, you will be saying that. Or 2-wheel-drive versus 4-wheel-drive, or a suspended operator's seat versus hard-mounted. Or cruise control versus NONE. Or tilt steering versus none. And the list goes on. Once you get that established we can give you some choices. Not much we can do if you "have a champagne taste on a beer budget", as the saying goes. Take a look at the CASE DX25E or the New Holland Boomer equivalent. They are easy to use, excellent on fuel and very reliable. With the front-end loader (FEL) you can scoop the poop and clear snow with ease, it will tow the heaviest loads and has a strong 3 pt hitch w/PTO. The mid-mount mower (MMM) is robust and will cut fields that have been cleared of heavy brush/debris. I have 15 acres and I'm pleased. Good Luck! Well I can say for sure that $10k is the max. I would expect to be buying used. I hope the recent ag boom hasn't boosted the price of this class of equipment. Those subcompacts sure look nice (hydrostatic) and definitely handle any attachment I could want. At that size I could still drive it down the barn aisle and load muck directly into the FEL. If you had to suggest something in the next size-class down, what would it be? For the things you need a tractor for, I'd say that you should be able to find something in the $10k range, quite easily. Look at the smaller tractors in the 18-24 horsepower range. You have many makes and models to choose from. My only suggestion would be to stay away from those imported Gray Market tractors, for which there are no manuals, and worse yet, no parts here in the U.S. Stick with the tractors that have dealerships here in the U.S. I wouldn't rule out the Kioti line of tractors. Kioti seems to offer a whole lot of tractor for the money, but you shouldn't have any trouble finding a used tractor, of any make, in your price range. Take a look at the link below. Tractorhouse has many small tractors listed. At the top of the home page, please click on the link "Under 40 horsepower". There are many tractors for sale......both new and used. Link: Tractorhouse.com -- New and Used Tractors, implements, etc. To me, if you have $10,000 CASH--not credit--to work with do yourself a favor and go one size up for a few thousand more. You might even want to forget about used and go new---put that $10,000 down on a new one that's bigger, stronger and can do more AND costs about the same or less in the long run as keeping a used one in tip-top condition (tractors aren't like cars where they require constant attention anyway). I found that used tractors can cost literally $10-$20 a month less to finance than a brand new one with a full warranty. New ones sometimes even offer 0%-interest too. I'm paying 3.9% on a $47,000 machine---that's like FREE money all things considered! I agree, new and financing with 0%. Take that same $10K and buy certificates of deposit at the highest rate of return your bank or credit union offers, with a certain percentage maturing at specific intervals over the life of the loan (and at which time the money is deposited into a savings account that the payment is drawn from). That way your money is working for you until it is needed to make a tractor payment. My dad was going to pay cash for his new Kubota, but the model fell under the 0% interest financing program. So I convinced him to do what I described above, and he's using the 0% financing to MAKE MONEY. Sure it is a little more work, and it isn't really big money, but everything helps, right? If $9K at 5% interest returns $450 over just one year, you can see the benefit gained. At least check into it. And you know that the tractor will have a warranty the length of the three-year loan term. There's always the possibility of that $10K tractor with no warranty ending up costing $15K or more...you know? Just my opinion. Good luck. So even for simply mowing around pastures and in pastures (at 4-5" cut height), light FEL work, you guys think I'll wish I had more power? While I truly appreciate using a tool that cuts work like a hot knife in butter, I know that I will need to conserve cash as much as I reasonably can. I have a sports car to spend my toy fix on. So, if you'll pardon my raw ignorance, how would I find myself wishing I had spent more? Fast mowing? Pushing snow? Do the lighter/smaller ones just do everything slower? Do they break more often? I think you'd be happy with the B7800...or maybe any of the Kubota B-series. Don't worry about the power issue. My friends rag me for having a 355ci engine in my 65 Nova...they say I need a big block. I don't care, I'm happy with the small block. I think that is a lot of what you'll experience with tractor talk as well. Kind of a Tim "The Toolman" Taylor kind of thing, you know...ugh, ugh, ugh! Get what you can with what you can afford...only you know your finances, right? I wouldn't say that the bigger tractors break down less often, nor would I say that you couldn't handle your chores with a smaller tractor. Rather, I believe most of the people who have responded here are trying to tell you that you will often regret not getting a bigger tractor, had you been able to afford one. In other words, don't settle for a small tractor, especially if you can afford a slightly larger one. We're not talking about monstrous machines here. Fact is, most machines up to about 40 horsepower are all about the same size. It's just that the more powerful machines will handle bigger projects a whole lot easier......and finding implements to use with tractors 25hp and more, is a whole lot easier than finding implements to match up with a 20hp horse tractor, or less.